If the Christmas season has become more of a chaotic consumer ritual rather than a nurturing spiritual time, you need this brilliant "Advent survival guide"! If you set aside just 10 minutes per day, Child of the Light will help you find your quiet center amid the stressful flurry of the November/December busyness. As you read the book's brief readings inspired by the season's carols and hymns, your spirit will be lifted, and your thoughts will be redirected to the purpose of the season: preparing for the coming of Christ. "Take time for God: that's exactly the challenge God gives us during this season of preparation," writes Richardson. "Personally and culturally, this time of year already seems to race out of control toward a Christmas finish line. In Advent, we are invited to take time out…[In] doing so, we nurture our spiritual self, that sometimes fragile part of us who longs for a connection with God." The reflections extend past Christmas to Epiphany, January 6, encouraging you to live into the joy of Christmas beyond traditional seasonal celebrations. A 5-week study guide is included at the back of the book, offering a simple structure for meetings: centering, reflecting, reading scripture, going deeper, and closing. The use of hymns and carols will engage even the most nonmusical among us to fully appreciate the lyrical richness of the season. Do you long for a more sacred and measured observance this year? 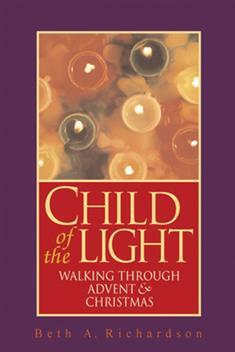 Be joyfully carried through the pre- and post-Christmas pandemonium as a child of the light!